The video below is from the August, 9, 2014, NEFAR rocket launch. 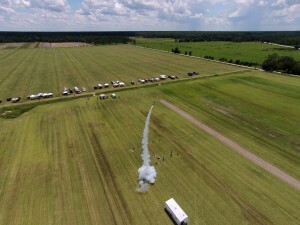 Taken with a quadcopter, the video captures the model rocket and high-power rocket launches from the air. Look for the model rocket producing a smoke ring when its ejection charge fires about half-way into the video. This entry was posted in NEFAR Launches and tagged launch video, nefar, quadcopter by Roger. Bookmark the permalink.